9:1 And Yehoshua (יהושע) went up into a ship, and crossed over, and came into His own city. 9:2 And, hinnei, they brought to Him a man stricken with paralysis, lying on a bed: and Yehoshua (יהושע) seeing their emunah said to the sick of the paralytic; Son, be of good cheer; your averot (sins) be forgiven thee. 9:3 And, hinnei, certain of the Sofrim said among themselves, This [man] is blasphemer. 9:4 And Yehoshua (יהושע) knowing their thoughts said, Wherefore think you evil in your hearts? 9:5 For whether is easier, to say, "[Thy] averot (sins) be forgiven thee; or to say, Arise, and walk? 9:6 But that you may know that the Ben man hath power on eretz to forgive averot (sins), (then said he to the stricken paralytic,) Arise, take up your bed, and go to thine bayit. 9:7 And he arose, and departed to his bayit. 9:8 But when the multitudes saw [it], they marvelled, and glorified Elohim (אלהים), which had given such power to men. 9:9 And as Yehoshua (יהושע) passed forth from thence, he saw a man, named MattitYahu, sitting at the receipt of custom: and he said to him, Follow Me. And he arose, and followed him. 9:10 And it came to pass, as Yehoshua (יהושע) sat at okhel (food) in the bayit, hinnei, many tax collectors and sinners came and sat down with Him and His talmidim. 9:11 And when the P'rushim saw [it], they said to His talmidim, "Why does your Master eat with tax collectors and sinners?" 9:12 But when Yehoshua (יהושע) heard [that], he said to them, "They that be whole need not a physician, but they that are sick." 9:13 But go you and learn what [that] meaneth, "I will have mercy, and not sacrifice": for I am not come to call the tzadikim, but sinners to repentance. 9:14 Then came to him the talmidim of Yochanan, saying, Why do we and the P'rushim fast often, but your talmidim fast not? 9:15 And Yehoshua (יהושע) said to them, Can the children of the bridechamber mourn, as long as the bridegroom is with them? but the days will come, when the bridegroom shall be taken from them, and then shall they fast. 9:16 No man putteth a piece of new cloth to an old garment, for that which is put in to fill it up takes from the garment, and the rent is made worse. 9:18 While he spake these things to them, hinnei, there came a certain katzin (leader), and worshipped Him, saying, My daughter is even now dead: but come and lay your hand upon her, and she shall live. 9:19 And Yehoshua (יהושע) arose, and followed him, and [so did] his talmidim. 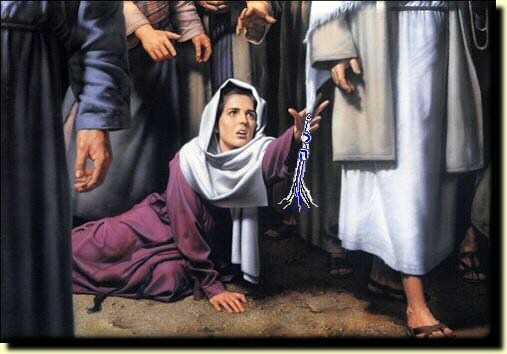 In an act of scandalous faith, she touches Yeshua’ garment’s “fringe”—no doubt one of the tassels (Tzitzit) worn by Jewish men, in obedience to Bamidbar15:38-41 and Devarim 22:12, on the four corners of their outer garment, and later on the prayer shawl (Tallit). The tassels were made of blue and white cords woven together. 9:22 But Yehoshua (יהושע) turned him about, and when He saw her, He said, " Daughter, be of good comfort; your emunah hath made thee whole". And the woman was made whole from that hour. 9:24 He said to them, Give place: for the maid is not dead, but sleepeth. And they laughed him to scorn. 9:27 And when Yehoshua (יהושע) departed thence, two blind men followed Him, crying, and saying, "[Thou] Ben David, have mercy on us." 9:28 And when he was come into the bayit, the blind men came to him: and Yehoshua (יהושע) said to them, "Believe you that I am able to do this?" They said to him, "Yea, Adonay". 9:29 Then touched he their eyes, saying, "According to your emunah be it to you". 9:30 And their eyes were opened; and Yehoshua (יהושע) straightly charged them, saying, "See [that] no man know [it]." 9:33 And when the devil was cast out, the dumb spake: and the multitudes marvelled, saying, "It was never so seen in Yisrael." 9:34 But the P'rushim said, He casteth out shedim (demons) through the prince of the shedim (demons). 9:35 And Yehoshua (יהושע) went about all the cities and villages, teaching in their shuls, and proclaiming the good news of the Kingdom, and healing every sickness and every disease among the people. 9:38 beseech you therefore Adon haKatzir (harvest), that He will send forth labourers into His harvest."